On the 19th (Mon), add some entertainment to your itinerary with Happily Ever After Fireworks and then test your problem-solving skills at popular escape rooms. To find photos, ratings, traveler tips, and more tourist information, you can read our Orlando holiday app . Zurich, Switzerland to Orlando is an approximately 12-hour flight. You can also do a combination of train and flight. The time zone difference moving from Central European Time (CET) to Eastern Standard Time (EST) is minus 6 hours. Traveling from Zurich in August, things will get somewhat warmer in Orlando: highs are around 39°C and lows about 28°C. Finish up your sightseeing early on the 20th (Tue) so you can travel to Pensacola Beach. Pensacola Beach is an unincorporated community located on Santa Rosa Island, a barrier island, in Escambia County, Florida, United States. 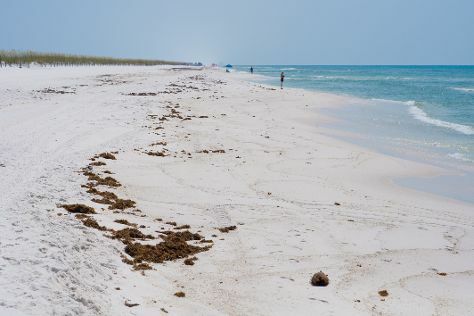 Start off your visit on the 21st (Wed): steep yourself in history at Fort Pickens Area, then enjoy the sand and surf at Gulf Islands National Seashore, and then kick back and relax at Pensacola Beach. To find ratings, maps, where to stay, and more tourist information, go to the Pensacola Beach trip itinerary planner . Traveling by combination of flight and car from Orlando to Pensacola Beach takes 5 hours. Alternatively, you can drive; or take a bus. You'll gain 1 hour traveling from Orlando to Pensacola Beach due to the time zone difference. August in Pensacola Beach sees daily highs of 38°C and lows of 28°C at night. Wrap up your sightseeing on the 21st (Wed) early enough to drive to New Orleans. Kick off your visit on the 22nd (Thu): take a stroll through Royal Street, then learn about all things military at The National WWII Museum, and then appreciate the extensive heritage of Garden District. For traveler tips, maps, and tourist information, go to the New Orleans trip itinerary planner . Getting from Pensacola Beach to New Orleans by car takes about 4 hours. Other options: take a bus; or do a combination of taxi and flight. 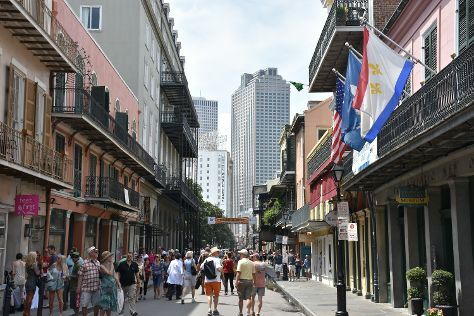 When traveling from Pensacola Beach in August, plan for a bit cooler days and somewhat warmer nights in New Orleans: temperatures range from 32°C by day to 32°C at night. Cap off your sightseeing on the 22nd (Thu) early enough to travel to Houston. On the 23rd (Fri), explore and take pictures at Minute Maid Park, then get curious at The Houston Museum of Natural Science, and then admire the sheer force of Water Wall. To see other places to visit, reviews, ratings, and tourist information, refer to the Houston travel route planner. You can fly from New Orleans to Houston in 4 hours. Alternatively, you can do a combination of car and flight; or drive. When traveling from New Orleans in August, plan for a bit warmer days and a bit cooler nights in Houston: temperatures range from 41°C by day to 29°C at night. Finish your sightseeing early on the 23rd (Fri) to allow enough time to travel to El Paso. El Paso is a city in and the seat of El Paso County, Texas, United States. On the 24th (Sat), learn about all things military at War Eagles Air Museum, explore the world behind art at El Paso Museum of Art, then pause for some serene contemplation at St. Patrick Cathedral, and finally cruise along Scenic Drive - Overlook. To find other places to visit and tourist information, refer to the El Paso trip planning site . Getting from Houston to El Paso by flight takes about 5 hours. Other options: drive; or take a bus. You'll gain 1 hour traveling from Houston to El Paso due to the time zone difference. Traveling from Houston in August, El Paso is little chillier at night with lows of 25°C. Finish your sightseeing early on the 24th (Sat) so you can travel to Phoenix. Phoenix is the capital and most populous city of the U.S. Kick off your visit on the 25th (Sun): explore the galleries of Desert Botanical Garden and then see the interesting displays at Musical Instrument Museum. Planning Phoenix trip won't be overwheling when you use's Insprock itinerary maker. Getting from El Paso to Phoenix by flight takes about 4 hours. Other options: take a bus; or drive. Traveling from El Paso in August, things will get a bit warmer in Phoenix: highs are around 47°C and lows about 33°C. Finish up your sightseeing early on the 25th (Sun) so you can travel to San Diego. On the 26th (Mon), have fun at Petco Park and then meet the residents at San Diego Zoo. To see maps, where to stay, reviews, and other tourist information, you can read our San Diego visit planning website . Traveling by flight from Phoenix to San Diego takes 3.5 hours. Alternatively, you can drive; or take a bus. The time zone difference when traveling from Phoenix to San Diego is minus 1 hour. When traveling from Phoenix in August, plan for cooler days and a bit cooler nights in San Diego: temperatures range from 30°C by day to 23°C at night. Cap off your sightseeing on the 26th (Mon) early enough to go by car to Los Angeles. Kick off your visit on the 27th (Tue): get in on the family fun at Universal Studios Hollywood. For other places to visit, where to stay, reviews, and tourist information, use the Los Angeles itinerary planner . Traveling by car from San Diego to Los Angeles takes 2.5 hours. Alternatively, you can take a bus; or fly. When traveling from San Diego in August, plan for somewhat warmer days and about the same nights in Los Angeles: temperatures range from 34°C by day to 22°C at night. Finish your sightseeing early on the 27th (Tue) to allow enough time to travel to Las Vegas. Start off your visit on the 28th (Wed): explore the stunning scenery at Red Rock Canyon National Conservation Area, take in panoramic vistas at Eiffel Tower Viewing Deck, and then don't miss a visit to Bellagio Fountains. Get ready for a full day of sightseeing on the 29th (Thu): try to win big at Wynn Las Vegas, have fun at Battlefield Vegas, and then shop like a local with The Strip. For photos, reviews, and tourist information, use the Las Vegas trip planner . You can fly from Los Angeles to Las Vegas in 4 hours. Alternatively, you can drive; or take a bus. Expect somewhat warmer temperatures when traveling from Los Angeles in August; daily highs in Las Vegas reach 45°C and lows reach 29°C. Wrap up your sightseeing on the 29th (Thu) to allow time to travel to San Francisco. Start off your visit on the 30th (Fri): head off the coast to Alcatraz Island, then wander the streets of Fisherman's Wharf, then browse the exhibits of SS Jeremiah O'Brien, and finally take in the views from Golden Gate Bridge. Here are some ideas for day two: engage your brain at Exploratorium and then don't miss a visit to Golden Gate Park. 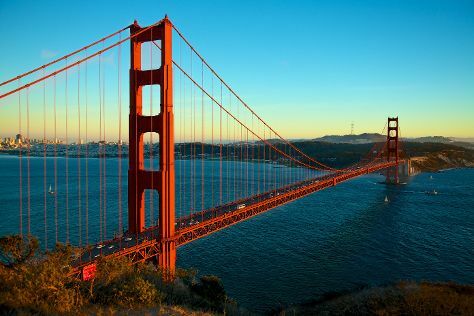 For where to stay, photos, other places to visit, and more tourist information, read San Francisco trip maker . You can fly from Las Vegas to San Francisco in 4 hours. Another option is to drive. While traveling from Las Vegas, expect cooler days and little chillier nights in San Francisco, ranging from highs of 26°C to lows of 17°C. Finish up your sightseeing early on the 31st (Sat) so you can travel back home.